The sternal angle (also known as the angle of Louis or manubriosternal junction) is the synarthrotic joint formed by the articulation of the manubrium and the body of the sternum. The sternal angle is a palpable clinical landmark in surface anatomy. 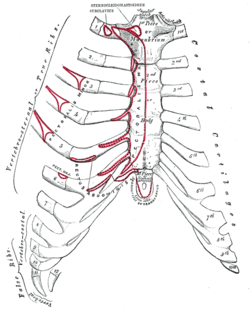 The sternal angle, which varies around 162 degrees in males, marks the approximate level of the 2nd pair of costal cartilages, which attach to the second ribs, and the level of the intervertebral disc between T4 and T5. In clinical applications, the sternal angle can be palpated at the T4 vertebral level. Junction of the intra and extra pericardial parts of the superior vena cava. Line junction between C4 and T2 dermatome. The angle is in the form of a secondary cartilaginous joint (symphysis). This is where the 2nd rib joins with the sternum. A clinically useful feature of the (manubriosternal) joint is that it can be palpated easily. This is because the manubrium normally angles posteriorly on the body of the sternum, forming a raised feature referred to as the sternal angle. The sternal angle is also called the angle of Louis, but the reason for that name was lost. Once thought to be after Antoine Louis or Wilhelm Friedrich von Ludwig, it is now believed to be after Pierre Charles Alexandre Louis. ^ Dalley, Arthur F.; Moore, Keith L. Clinically Oriented Anatomy. Hagerstown, MD: Lippincott Williams & Wilkins. ISBN 0-7817-5936-6. ^ a b Wilson, Herbert H. Srebnik ; illustrations by Genevieve M. (2002). Concepts in anatomy. Boston: Kluwer Academic Publishers. p. 70. ISBN 0792375394. ^ Susan Standring; Neil R. Borley; et al., eds. (2008). "Chapter 54: Chest wall and breast". Gray's anatomy : the anatomical basis of clinical practice (40th ed.). London: Churchill Livingstone. p. 922. ISBN 978-0-8089-2371-8. Anatomy photo:18:st-0212 at the SUNY Downstate Medical Center - "Thoracic Wall: Bones"